The Accord has always been an important vehicle to Honda. The Accord accounts for a huge chunk of production (and revenue) for the automotive giant. Because of this every introduction of a new generation of Accord is important in many ways. 2011 was a rough year for Japanese automakers in general. The Japan earthquake and the flood in Thailand seriously curtailed the number of vehicles produced for the model year. Suppliers had to rebuild, Honda scrambled to find alternative sources of parts and supplies. Honda used this time to prepare for a ramp-up of output in the first quarter of the new year. Inventory increased 46,000 units and hasn’t looked back ever since. Accord sales alone are up nearly 28% since January, a huge turn-around from 2011. The 2013 Accord represents the ninth generation of the famous brand, with its ancestry dating back to 1976. The Accord has a reputation for being a solid and reliable family car, able to haul a family and their gear throughout their day-to-day adventures. The sedan excels at fading into the background; becoming ubiquitous and unassuming. Not a bad thing for a people-hauler. The Accord comes in three body styles: the Sedan, the Coupe, and the Plug-in Hybrid Sedan. Each is based off the same chassis and shares a majority of components. The continuation of the Coupe is a bit of a surprise given that the segment seems to be shrinking. There are a variety of engines available that also define the offerings. The base four-cylinder 2.4 liter i-VTEC DOHC engine is available in both the Coupe and the Sedan, while the more powerful 3.5 liter six-cylinder is an option. The Hybrid Accord comes equipped with a two-motor 2.0 liter powerplant, unique to that vehicle. Honda has focused on designing their vehicles around the concept of maximizing space for the occupants while minimizing the overall size of the vehicle. To that end the car is developed from the inside out: the passenger cabin space is defined and the designers must create a body that fits around the occupants. 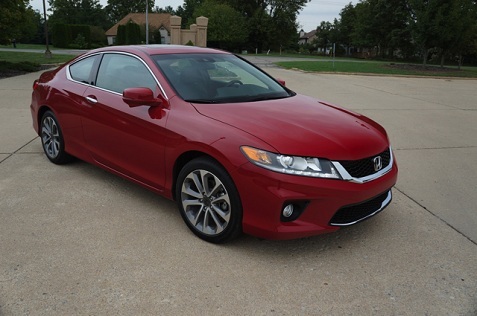 To that end the 2013 Accord Coupe, for example, has been shrunk by nearly two inches in overall length, while gaining about an inch of leg room and almost two cubic-feet of storage in the trunk. 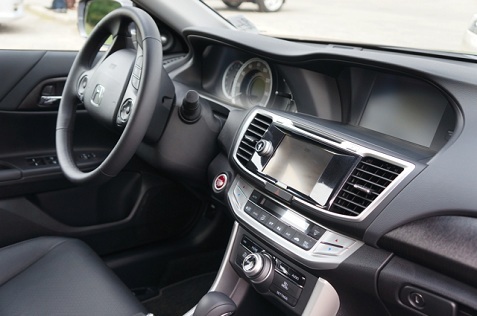 The interior of the new Accord is a great improvement over the outgoing model. Utilitarian plastic and vinyl have been replaced with higher quality materials. Brushed aluminum accent pieces on higher-end trim levels add to the feeling of an upscale vehicle. Honda has replaced the multi-piece dash with a one-piece instrument panel designed in-house. The new dash reduces rattles and squeaks and feels very solid. The dash is the focus of the new car, with a split two-screen control system acting as navigation and stereo controls. Rear-view cameras are now standard across all versions, which is a big selling point for those of us who fear backing over an errant tricycle. It worked well, as the screen is mounted high and centrally located, making it a snap to use. The navigation system seemed adequate, as did the stereo. Honda is rolling out it’s HondaLink system with the new Accord, which offers smartphone app support through device tethering. We didn’t get to test the system ourselves, but after seeing a demo of it I’m looking forward to getting a better look. Also available is a Lane Departure Warning (LDW) system that alerts you when you drift slightly while driving. By slightly I do mean slightly, as the system kept triggering at the slightest provocation. Simply merging from an off ramp into traffic would sometimes cause it to chirp. Half-way through the test drive we were looking for a way to disable it. As mentioned earlier, the new Accord is slightly smaller than the out-going model. But the change isn’t noticeable. The lines of the car feel more defined, more aggressive. Honda used a new and improved stamping process for the new car and it shows in the presence the car exudes. An important feature of the new car is the addition of an external rear-facing camera mounted on the passenger side mirror. This camera aids the driver by showing in the center display an image of what’s in the car’s right-side blind spot. Flip on the right turn signal and get a bird’s eye view of what’s in the way. In practice this is an incredible feature. 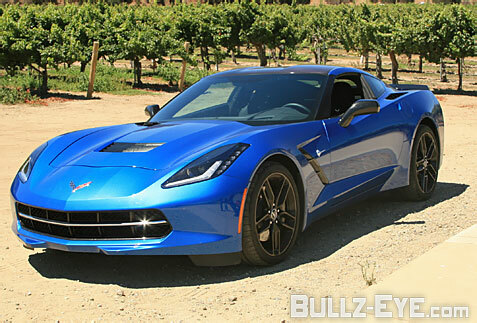 During our test drive it became an easy thing to grow accustomed to. It’s a serious tool for highway driving. The 3.5L six-cylinder’s output is up 7 horsepower from last year’s engine, up to 278. It gives the Accord a more spirited drive, and actually wakes up the vehicle. The engine note on the sixer is raspier and more aggressive; stomp on the gas and you’ll hear it. For my money this is the engine of choice. Pricing for the Accord ranges from $22,000 for an Accord LX to $33,000 for a well-optioned Touring model. Quite a range, but within the pricing horizon of its competitors. The Accord Sedan will go on sale September 19 across the country, while the Coupe, which will start at $23,350, won’t be available until October 15. 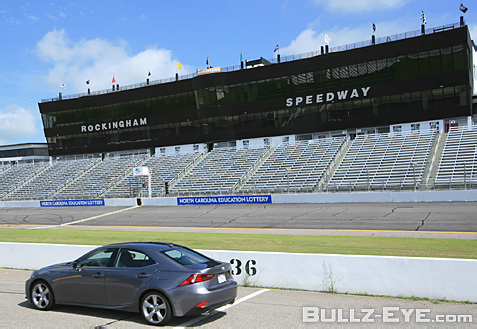 The first impression of the 2013 Accord is one of a competent and solid car. Honda is a company led by engineers, and it shows. The amount of effort that has gone into refining this icon is impressive. I look forward to driving it long-term to see if that first impression holds up over time. Carmakers have been racing to bring our connected lifestyle to the automobile. As more features and capabilities are added to our phones and other devices, consumers want the same functionality available to them in their cars. This poses challenges, however, as carmakers naturally need to consider safety when deciding which features are appropriate for drivers and how they can be accessed while driving. Additionally, long lead times and engineering constraints make the addition of new features even more challenging. You can add features, but you need to be conscious of the overall driving experience. Last week Cadillac introduced their new CUE service to the media in San Diego and we were invited to attend. CUE which stands for Cadillac User Experience, and the CUE team had a fully-functional test system available to us. Based on what we saw, CUE represents a great leap forward in the race to bring the digital lifestyle to the automobile. New innovations like tactile feedback on your finger when you touch the 8-inch center stack screen and proximity sensing that has control buttons pop up on the screen as you hand approaches make this system very user friendly, and the customization features make CUE a very powerful system that greatly enhances the driver experience. The industry-first proximity sensing feature was the most impressive innovation. The CUE team wanted the screen layout to be clean and uncluttered so that the driver would only see the information the driver needs at a particular time. They didn’t want to clutter the screen with unnecessary icons for example while the driver was in the navigation system or the media area. On the other hand, you want to have all important options available in the form of icons without putting more buttons on the center console. The solution they came up with was proximity sensing. Additional icons to carry out commands, including your favorite presets and the controls for the app you’re in would show up in two bands across the bottom of the screen as your hand approaches the screen, and then the icons go away as your hand pulls back. You can see examples of the icons in photos #1 and #5 above. With this innovation, drivers get the best of both worlds – an uncluttered screen and multiple options when needed. The customization features make CUE very powerful and easy to use. The most frequently used applications like your nav, phone and radio are available along the top of every screen in the system in an “app tray.” This app tray can then be customized, as users can drag any icon from the home page to the top of the screen. You can also set up to 60 presets and they can be from any app. The first six will show up along the bottom bar when your hand approaches (you swipe the screen to see the rest), and they can include your favorite radio stations or Pandora stations, favorite playlists and nav routes like Home. You can set a preset at any time, but customization and altering the order can only be done when you are parked. The key here is that you can avoid going through menus every day and have your most commonly used apps and services in your favorites. You can also set your screen to display 15 favorites at once. The result is also fewer buttons on the center stack, as only critical commands are needed offering a much simpler and elegant arrangement. The CUE system goes beyond the center stack, however, to include the gauge cluster immediately in front of the steering wheel. The 12.3-inch reconfigurable LCD gauge cluster will be available on select models and can be customized into one of four screen layouts, with information options including traditional vehicle data such as readouts for fuel levels and speed along with navigation, phone and entertainment information. The ability to put navigation information in this gauge area is my favorite feature, as you don’t need to turn your head at all to visually follow the instructions. These features are just some of the capabilities built into CUE. 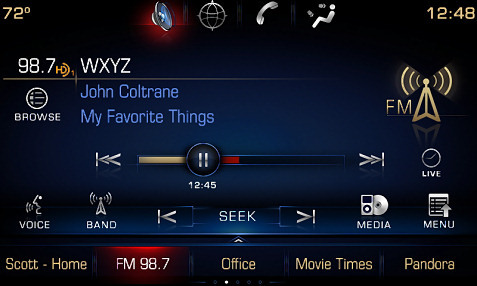 The center stack display works like today’s smart phones with swiping capability to move around the icons, and Cadillac developed a natural speech recognition system (which we couldn’t realistically test here). I also liked the single line destination entry for navigation. CUE will debut in 2012 in the Cadillac XTS and ATS luxury sedans and SRX luxury crossover and will be presented at the 2011 LA Auto Show. The technology and media experiences are becoming critical factors for consumers, and CUE looks like it can be a huge hit for Cadillac.